Social media users mistook an unidentified man posing with the Indian captain after second day's play of their warm-up match against Essex for absconding liquor baron Vijay Mallya. 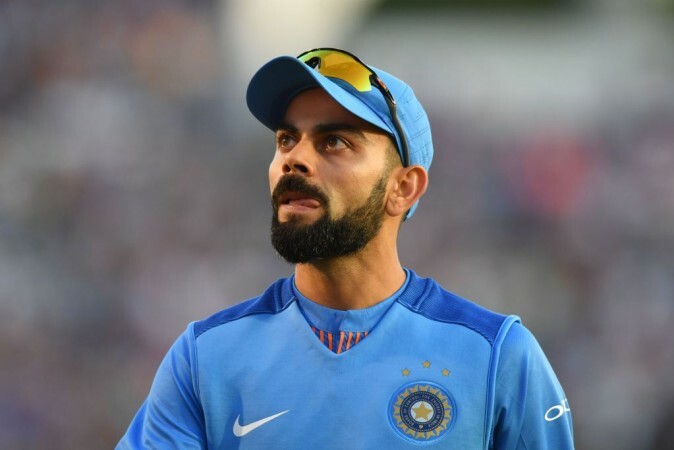 Virat Kohli faced the wrath of quite a few social media users who believe the India captain posed for a photo with fugitive businessman Vijay Mallya after the team's warm-up match in England. The confusion arose when the official Instagram page of the Indian cricket team uploaded a photo of Kohli with Bhangra dancers and an unidentified man, who bore an uncanny resemblance to Mallya, the Bengaluru-based liquor baron who is facing charges of fraud and money laundering. The caption for the photo read: "They all love him here #KingKohli" as the Indian captain was seen resting his hands on the shoulder of the Mallya lookalike after second day's play of India's practice tie against county championship side Essex. Mallya was officially declared as an absconder and the Indian government is working towards extraditing Mallya from the United Kingdom where he is currently based. 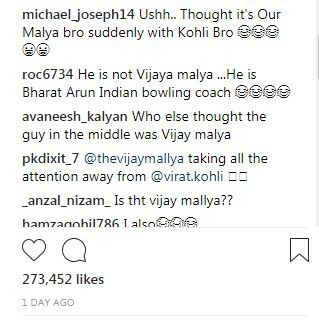 Fans began to wonder if the person in the photograph was actually Mallya while one of the Instagram users even commented that it wasn't the notorious businessman but bowling coach Bharat Arun. While it is safe to say that the fans' guesses were wrong, the identity of the man in the said photograph remains unknown. A section of social media users went to the extent of demanding harsh punishment for Kohli for posing with the "absconder", who was also the former owner of the Delhi batsman's Indian Premier League (IPL) franchise Royal Challengers Bangalore. Indian cricket team’s official Instagram handle posted a picture of an unspecified person with Virat Kohli, leading online fraternity into a furore. @BCCI @ndtv @TimesNow @IndiaToday @CNNnews18 @MirrorNow Virat Kohli should be banned for few years for his meeting with Vijay Mallya in England, who has cheated the banks and is an absconder. Kohli and his men came up with an under-par showing in the recently-concluded three-day warm-up match. While Shikhar Dhawan and Cheteshwar Pujara struggled to get going in both the innings, the Indian bowling attack struggled to bowl out the county side even after bowling 94 overs. Umesh Yadav was amongst the wickets but the absence of injured Bhuvneshwar Kumar and Jasprit Bumrah was seen in the match at Chelmsford. The likes of Ishant Sharma, Mohammed Shami, and Hardik Pandya struggled to get the breakthroughs on what seemed to be a helpful track for the pacers. Kohli and the team management will be hoping to find the right combination ahead of the much-anticipated five-Test series, starting August 1.